Stonco’s LytePro16 architectural LED wall sconce is DLC Compliant. On Monday, March 19, the LP16 was listed under the DLC website as a registered product for rebates. 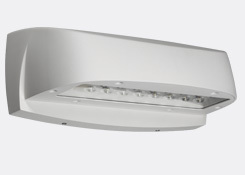 Part of a family of high performance outdoor LED luminaires that includes the LytePro7 wall sconce and the LytePro Plus LED area luminaire the architecturally attractive LytePro16 is a compact LED luminaire designed for exterior wall mounting in commercial applications. It is ideal for general- purpose illumination along perimeters, entrances and garages for safety and security installations as well as accent lighting around buildings. The series is designed to be complementary and deliver correct scale proportionality for all facets of your installation. LytePro16’s precision optical system includes 16 high-output LEDs consuming only 40 watts for economical operation. The shielded optics deliver minimal glare and high uniformity at 4000K neutral white color temperature. Constructed of a die-cast aluminum, the euro-styled fixture includes and integral heat sink ensuring cool operation for a 60,000 hour rated life. LytePro16 features Philips LEDGINE a unique and upgradeable light engine system developed by Philips that will maintain pace with improvements in LED modules and drivers. LEDGINE’s future-proof design simplifies light engine replacement so no one gets left behind as new technology comes out. 60,000 hours at 25C Ambient Temperature, will outlast HPS by 3X, CFL by 6X and Incandescent by 80X. Learn more about the LytePro family at www.crescent-stonco.com/lytepro/. A Philips company, Crescent/Stonco Lighting manufactures a wide range of contractor-friendly lighting products for both the industrial and commercial markets. These products include floodlights, industrial lighting, surface-mounted fixtures, landscape lighting with a broad selection of lamp holders and mounting accessories. For more information, visit the Crescent/Stonco’s website at http://www.crescent-stonco.com/.